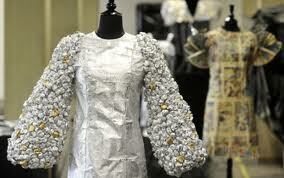 Initially for our Broadcast show we decided to base the whole topic on ‘Recycled Fashion’. Our main aim was to produce content within the recycled clothing and evolvement of fashion trends using rare recycled objects and old clothes. We had a few ideas of interviewing a student Fashion Designer ‘Caroline’ whom had been successful in her recent ‘recycled project’. She created a recycled piece of clothing from simply using plastic bags. With her prenominal achievement, of coming third place in a Marks & Spencer’s competition as well as winning the chance to have her product reproduced to be sold in M&S stores, we were overwhelmed by having such a guest on our show. As well as an interview, the PA; James emailed the Trend Hunters team, where we received a positive response. They were willing to provide a Skype interview for the show. The Trend Hunters are a Youtube Fashion channel, in which their ‘Toilet Paper Fashion show’ would feature as a VT on our show. With the interviews, the spontaneity would come through the questions, such as ‘What inspired you?’ etc. As for the competition links we decided to stick to the Fashion theme and give away £50 worth of BooHoo vouchers. The competition followed the audience tweeting in photographs of their recycled outfits. Thus throughout the show we also constantly mentioned how they could get involved using; Twitter, Facebook and Text messaging. However, with our theme given as ‘spontaneity’ we also agreed upon the fact that the show didn’t consist of many ‘spontaneous’ elements. After receiving feedback from our Tutor; Mez, she concluded that our show needed more of a spontaneous bounce. We immediately began discussing new ideas once again. We completely agreed with Mez with the fact that our show simply didn’t have that shock, random or exciting moment. 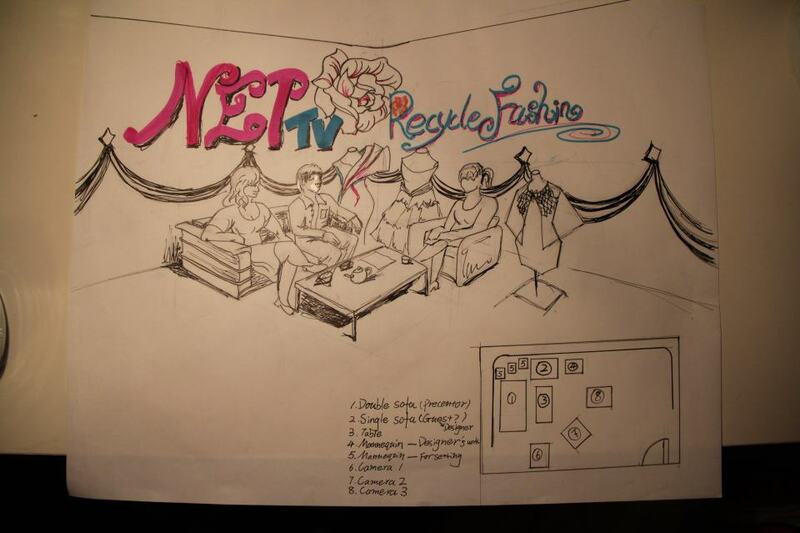 Therefore, we have thought of a few new ideas, which consist of the Presenters continuously changing outfits. Such as silly fancy dress costumes or some bright colours. In the show the presenters could remain acting normal, but randomly change clothes, where the audience would begin to funnily question what’s happening. We are also planning a few VERY spontaneous ideas, such as proceeding with something without telling the presenters. (Which of course I can’t spill anything on here). But of course this would add a comedy element and definitely compliment with our theme. We have been inspired by a few ideas which involved ‘bringing a live snake into the studio and scaring the presenters’ though of course as the Producer speaking, Health & Safety wise, this would be impossible. Funny but impossible. Currently we are still in the process of putting the show together and melding up with ideas to match our theme. Below is an image of our studio layout.